Today's project started out as a couple of experimentations, and in the end I turned into this card. It's a bit on the Renaissance side for me, but still I'm pretty happy with it. First here's my card. My background is using a technique commonly referred to as Burnished Velvet. 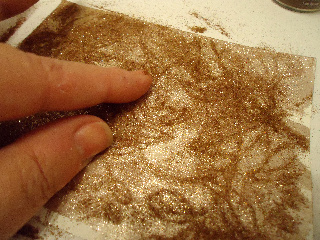 The twist here, is that instead of both colors being glitter - I combined it with Rangers Distress powder (Vintage Photo) I've seen this technique before but always with glitter! So really wanted to try this out! Our Your So Fine Glitter - from the The Rubber Cafe' - is perfect for this technique becamse it is so so fine! And does give a smooth feel when touched. The second fun part of this project is I created my own Sticky back sheets with the Scrap Happy Glue from the Rubber Cafe'. Here's my tutorial- starting with how to make my Scrap Happy sticky sheets. 1. 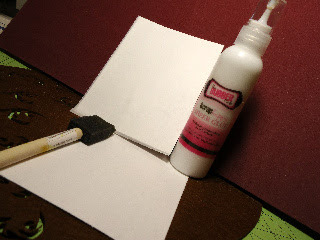 To begin, I took an 8 1/2 x 11 sheet of cardstock - and a coat of Scrap Happy Glue on the entire surface, and set it aside, I applied another layer as the first one set. I want enough for coverage but not so thick that it adds to much depth to my sheet. 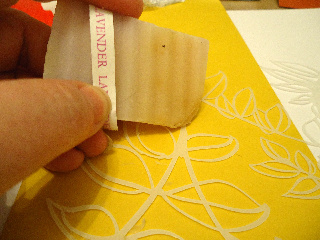 To cover the open sticky portion, I covered it with a piece of Parchment paper, setting it aside to 'cure'. Next I took my trimmer and cut this pc into 4 equal pieces, to be used for 4 card face fronts. 2. Then I gathered my supplies, a mask or stencil, my Your So Fine glitter in Bronze Medal, and Ranger's Distress Ink- Vintage Photo. And one Scrap Happy Sticky sheet. Below you can see the parchment paper partially pulled back as it is be prepped for use. 3. For this next step I took some home-made soap (use only home-made or natural soaps for this step) This step was recommended with the use of the metal Dreamweaver's stencils, but I found even with my more flexible plastic stencil this step worked well for me as well, in assisting in easy removal of the stencil from my 'Scrap Happy' Sticky sheet. 3.With my stencil in place I took my parchment paper and laid it back down so I could rub the entire stencil well and ensure, my stencil would not 'lift'. 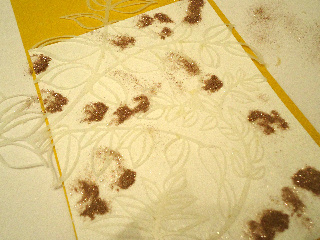 Next pulled the parchment paper off, stencil securely in place, I started applying small portions of Glitter all over my design. 4. 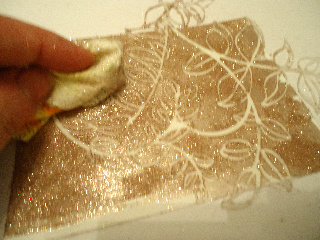 Using my finger I burnished the glitter into the sticky adhesived cardstock until it was spread over the entire area. 5. 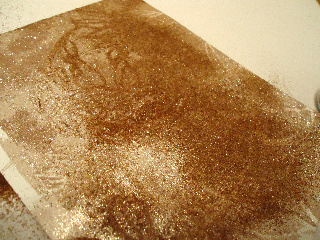 Once my first layer of glitter was done, in prepping for the Distress powder layer I took my dry Towelette, and wiped the excess glitter away. I swiffer sheet works for this too. 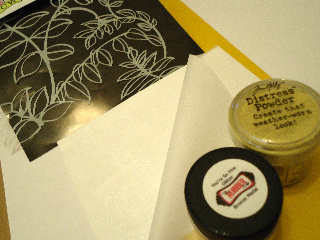 Expose the stems and leaves on the Sticky Paper these are the areas, we'll apply my Vintage photo embossing powder. 7. Here's my surface so far, ready for the next step. 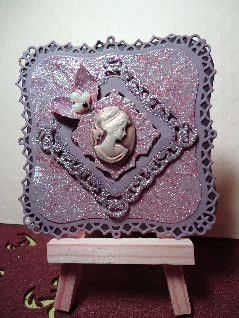 Now that I've exposed the positive space - I can add my Distress Embossing powder, Vintage photo. 8. 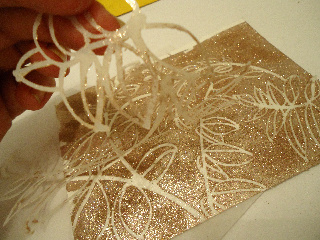 Like with the glitter layer, I pushed the embossing powder around the stems and outline of the leaves with my finger. 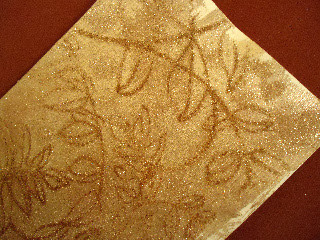 The areas with the glitter already applied will act as a resist. 9.Wiping away the excess, I then heat set the embossing powder. Remember this is Distress Embossing powder so it does not shine, so provides a very subtle outline to my Your So Fine Glitter. To finish my card, I diecut and layered using the Spellbinder dies and embellished with a cameo, punched leaves and a stickpin. Give this a try- I have another snow flake stencil I want to try out this technique on. The results are somewhat un-expected. But I think it turned out very pretty! 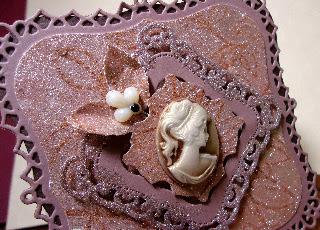 Embellishments The Rubber Cafe' - Your so Fine, Bronze Medal, Ranger Distress Embossing Powder- Vintage Photo, misc Cameo and stick-pin bling. wow...fun technique! :) sticky sheets, eh?! great idea! Cool technique - LOVE the finished card! Super cool technique. I have only done the glitter version. 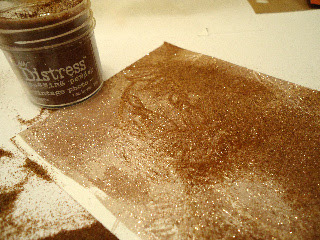 I really want to try it again with the distress EP, and with the super fine glitter! WOW! What a sparkling beauty!!!! thakks for sharing...really nice work.... i will also try this.. i would also like to add about rubber sheet.rubber sheet has excellent mechanical ,dynamic and rebound propertie.rubber sheets are good insulators and good resistance for all acids,bases and salts.we can use rubber sheet roughly anywhere they would never lose physical characteristics.rubber sheet are used in some batteries in combination with wood separators.